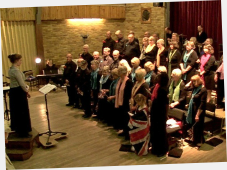 Twyford Singers took its audience on a whistle stop musical tour through the concert halls, cathedrals, theatres and streets of Europe at their Summer Concert at the end of June. They visited France, Spain and Germany but also further afield to Russia and Norway. Martin Lorenz, a Russian speaker was very impressed with Rachmaninov’s Bogoroditse Devo. 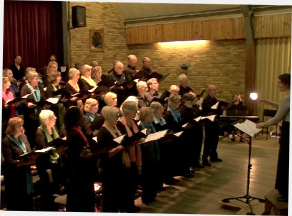 There was a mixture of choir pieces and soloists, the soloist all being members of the choir. The opening Gloria (Vivaldi) got the concert off to an energetic start. 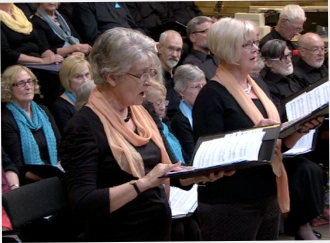 The first half was focussed on sacred and folk influenced music the highlights of which were Dvorak’s “Goin’ home”, Scubert’s Ave Maria (sung by sops and altos) and Rachmaninov “Borgorodiste” which was sung unaccompanied. 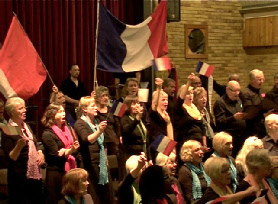 The second half was much lighter in tone and included much music from operas and musicals. 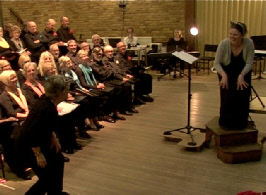 The opening piece – Polostivian Dances (Borodin) was sung with conviction, and the Anvil Chorus had real character. The tenors and basses had a chance to shine in Granada and the whole choir enjoyed singing O Sole Mio. Danny Walsh accompanied himself on guitar to give an entertaining rendition of La Mer. One audience member said they were really impressed by the quality and variety of singing. One of their highlights was the Rossini Due Gatti performed by Helen Styles and Sue Thomas. Perhaps the concert was best summed up by Mary Elliott who said the concert was "exactly her cup of tea. A really good mix of music with the sacred items not being too serious and paired with good songs and some very entertaining items."